Some people wonder, “Do I really need to see the dentist twice a year?” They say just brushing and flossing should be enough. Massapequa dentists, Drs. Dory and Khalida Stutman, maintain that good dental health needs periodic maintenance. So, they prevent problems with dental treatments that ensure teeth and gums are healthy and strong. Learn here about semi-annual exams and cleanings. Patients from toddlers through adults in their senior years should see their dentist in Massapequa every six months or more frequently as needed. Dr. Dory Stutman and Dr. Khalida Stutman believe that regular check-ups and hygienic cleanings at South Shore Dental Care prevent tooth decay and gum disease from ruining tooth enamel and destroying gum tissue and underlying bone. Additionally, Dr. Stutman checks every patient’s mouth for signs of oral cancer–a frequently hidden and potentially fatal disease that affects over 45,000 adults each year in the United States. Detected in its earliest stages, oral cancer can be successfully treated; so routine screening is very important. Finally, a friendly hygienist cleans a patient’s teeth during a six-month visit. She gently removes the sticky plaque and hard tartar that accumulate in interdental spaces and under the gum line. This is the biofilm that at-home brushing and flossing cannot reach. It harbors oral bacteria that secrete damaging acids and that infect gums. When teeth and gums are free of plaque and tartar, they thrive and are less prone to serious dental issues. The dentist addresses immediate needs and also aesthetic goals. The doctor writes an individualized treatment plan. 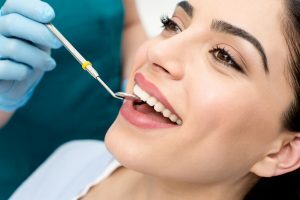 This can include necessary restorations, such as gum disease therapy or fillings, and aesthetic treatments, such as teeth whitening and porcelain veneers. Other preventive measures, such as mouthguards to protect against tooth-grinding and sealants and fluoride treatments to ward off decay, are often incorporated. Be sure to keep on brushing and flossing daily as recommended by the American Dental Association. Also, schedule a dental exam and cleaning at South Shore Dental Care. The expertise and care of the dedicated team will keep you smiling and healthy. by: South Shore Dental Care at October 12, 2016 .